Analysis of the Escherichia coli collection of reference strains (ECOR) for the presence of the gene locus clyA, which encodes the pore-forming protein ClyA (cytolysin A), revealed that a non-functional clyA locus is common among certain extraintestinal pathogenic E. coli (ExPEC). In fact, all 15 ECOR group B2 strains and several additionally examined extraintestinal pathogenic (uropathogenic (UPEC) and neonatal meningitis (NBM)) E. coli strains contained various ΔclyA alleles. There are at least four different variants of ΔclyA, suggesting that such deletions in clyA have arisen at more than one occasion. On the basis of this occurrence of the truncated clyA genes, we considered that there may be a patho-adaptive selection for deletions in clyA in extraintestinal pathogenic E. coli. In E. coli K-12 the clyA gene has been viewed as cryptic since it is tightly silenced by the nucleoid structuring protein H-NS. We constructed a restored clyA + locus in derivatives of the UPEC strain 536 for further investigation of this hypothesis and, in particular, how the gene would be expressed. Our results show that the level of clyA + expression is highly increased in the UPEC derivatives in comparison with the non-pathogenic E. coli K-12. Transcription of the clyA + gene was induced to even higher levels when the SfaX regulatory protein was overproduced. The derivative with a restored clyA + locus displayed a somewhat slower growth than the parental UPEC strain 536 when a sub-inhibitory concentration of the antimicrobial peptide Polymyxin B was added to the growth medium. Taken together, our findings show that the clyA + locus is expressed at an elevated level in the UPEC strain and we conclude that this is at least in part due to the effect of the SfaX/PapX transcriptional regulators. A majority of Escherichia coli strains are benign residents of the intestinal tract of mammals, however a minority of E. coli isolates are pathogenic and cause a variety of diseases ranging from diarrhea to urinary tract infections and to meningitis. Genes encoding virulence factors such as adhesins, invasins, and toxins that allow pathogenic E. coli to colonize, invade, and damage host cells, are often coordinately regulated and tend to be clustered in the genome. The ability to lyse erythrocytes (hemolysis) by expression of hemolysins is a common feature among E. coli strains causing extraintestinal infections. One of the most characterized hemolysins is HlyA or α-hemolysin which is produced by uropathogenic E. coli (UPEC), although several other types of hemolysins have been described for E. coli from different patho-groups . The clyA gene, located at 26.5min on the E. coli chromosome, encodes a 34-kDa protein, ClyA (also referred to as HlyE and SheA) which causes lysis of mammalian cells by pore formation in a calcium-independent fashion. ClyA is the only cytolytic factor found in non-pathogenic strains of E. coli including the K-12 strains commonly used in laboratory studies -. The clyA + transcription is known to be subjected to transcriptional silencing by the H-NS nucleoid protein in E. coli K-12  and it can be activated by the transcriptional regulator SlyA [2,4,5,8]. Considering the strict regulation of clyA in non-pathogenic E. coli laboratory strains it is of interest to understand how this gene locus functions in other E. coli isolates. Sequences homologous to the clyA gene have been identified in a number of pathogenic isolates of E. coli[2,6,9,10]. In addition, upon screening of several different Salmonella enterica serovars, functional homologues to the clyA gene were identified in the typhoid Salmonella serovars Typhi and Paratyphi A . The presence of the clyA gene in wild-type isolates of Salmonella suggests a conserved function of the gene product although its role in pathogenesis is unclear. Nevertheless, ClyA appears to be associated with virulence in S. enterica. The role of ClyA in Salmonella virulence was analyzed using the S. enterica serovars Brandenburg, Indiana, Panama, and Schwarzengrund; 21 different serotypes of the strains were examined and the presence of ClyA was suggested to be associated with virulence in these S. enterica serovars . In bacteria, the process of adapting to a host may involve not only acquisition of virulence determinants but also loss of gene functions. Pathogenicity-adaptive, or patho-adaptive, mutations may represent a genetic means for enhancing bacterial virulence without horizontal transfer of specific virulence factors, i. e. genes that are detrimental to a pathogenic lifestyle are deleted . Such patho-adaptive mutations, which occur following the acquisition of new genes, may represent fine-tuning of the genome repertoire of a newly created pathogen to adapt to its new pathogenic lifestyle . Earlier studies have provided genetic and/or phenotypic evidence for naturally occurring mutations that are either required for, or dramatically increase the ability of bacteria to enter, spread within, or sustain themselves in a virulence niche [14,15]. For instance the spontaneous deletion of cadA, encoding lysine decarboxylase, substantially increases the virulence of entero-invasive E. coli (EIEC) and Shigella spp..
E. coli is considered to be clonal, and phylogenetic analyses of this species have shown that the strains fall into four main groups: A, B1, B2 and D . Recent attempts to establish a link between phylogeny and virulence suggest that the A and B1 phylogenetic groups should be considered to represent the normal flora of different vertebrates, and most human commensal strains originate from these groups -. The standard Escherichia coli collection of reference strains (ECOR), a set of E. coli strains isolated from diverse hosts and geographic locations, was designed to represent genotypic variation in E. coli. The collection contains 72 wild-type E. coli isolates from human and 16 other mammalian species, obtained from a larger collection of approximately 2600 isolates . Our previous results clearly showed that the clyA locus was truncated due to deletion mutations in several of the E. coli isolates . One or more deletions in the clyA locus were found in 15 of 15 tested ECOR B2 strains . Furthermore, deletion mutations in the clyA locus were identified in two of the 25 (8%) ECOR A strains, one of the 12 (8%) ECOR D strains and one of the four (25%) ECOR E strains. In contrast, an intact clyA locus was found in 100% of the 16 ECOR B1 isolates examined. The B2 phylogenetic group represents E. coli strains involved in extra-intestinal infections . The uropathogenic E. coli isolates 536, J96, and five additional (strains AD110, DS-17, IA-2, IH11128 and IHE3034; see Table1) previously described extra-intestinal pathogenic (uropathogenic E. coli and newborn meningitis E. coli (NMEC)) carried a truncated clyA gene. At least four different variants of ΔclyA exist among such strains suggesting that the deletions in clyA arose on more than one occasion . Similar findings have been reported from additional surveys of E. coli isolates from different sources -. Furthermore, the recent study by Murase and co-workers showed that gene inactivation at the clyA locus also has occurred in strains of the ECOR B1 phylogroup -. In this report we present findings with derivatives of E. coli K-12 and the UPEC isolate E. coli 536 in which we constructed a restored clyA + locus as well as a clyA-lux chimeric operon to quantitatively measure expression at the transcriptional level under different growth conditions. Analysis of the DNA sequences revealed four different variants (denoted I to IV) of the ΔclyA alleles and differences in their distribution in the E. coli isolates -. The strains used in this study are summarized in Table2 and sequence details are shown in Figure1. Deletion variant I include two deletions: one major 493-bp deletion spanning from 164bp upstream to 329bp downstream of the clyA translational start codon, and one minor 204-bp deletion spanning from 382 to 585bp downstream of the clyA translational start codon. Variant I was found in 13 of the 15 ECOR B2 strains, in ECOR23 and ECOR24 of group A, and in the UPEC/NBM isolates AD110, DS17, IA2, IH11128, IHE3034 and J96. Deletion variant II is similar to variant I, but with an intact 1327-bp IS-2 element positioned adjacent to the upstream 493-bp deletion in the opposite orientation of the clyA coding sequence. Variant II was found in ECOR61 and ECOR62 of group B2. Deletion variant III is similar to variant I with a deletion in the promoter region but in addition had a deletion in the clyA coding region. Variant III was identified in the UTI isolate 536. Deletion variant IV is a 12-bp-long in-frame deletion from 547 to 558bp downstream of the clyA translational start. Variant IV was found in the ECOR43 and ECOR44 group E and D, respectively. 1)The ECOR subgroups are as defined previously . UTI, urinary tract infection. NBM, newborn meningitis. 2)+denotes that an intact clyA locus is present; Δ denotes that some deletion(s) had ocurred. 3)I-IV denotes the different deletion variants within the clyA locus as described in the text and in Figure1. Sequence representation of the different clyA deletion variants (indicated by roman numerals I-IV) found among different E. coli isolates with mutant clyA loci: ECOR51 (Δ clyA I), ECOR61 (Δ clyA II), 536 (Δ clyA III) and ECOR43 (Δ clyA IV). Position coordinates are relative to the clyA start codon in E. coli K-12. 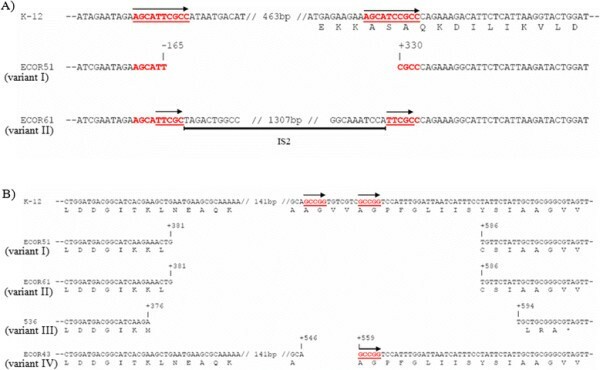 Sequence repeats are indicated by red underlined bold face and are highlighted with arrows. The extent of the IS2 element is indicated by a black bar. (A) Deletions in the clyA upstream region and N-terminal coding sequences. (B) Deletions in the clyA C-terminal coding sequences. The presence of a nearly perfect 10-bp repeat (AGCATTCGCC) immediately upstream of the major 493-bp deletion, and overlapping with the 3′ end of the deleted segment (AGCATCCGCC) (Figure1A), suggested that the variant I deletion was the result of a recombination event. We found no such DNA repeats that would explain the internal 204-bp or 217-bp deletions in the clyA coding sequence (Figure1B). As shown in the case of variant IV (Figure1B) a short 5-bp repeat (GCCGG) was identified at the junctions of the 12-bp internal deletion observed in ECOR43 and ECOR44, indicating that this deletion is likely to be the result of a recombination event. The site of insertion of the IS2 element and the generated 5-bp direct repeats (TTCGC) in ECOR61 and ECOR62 suggested that the IS2 element was inserted after the deletion was generated (Figure2A). Introduction of a clyA + locus in UPEC strains. (A) Schematic representation of the clyA loci in E. coli K-12 and in derivatives of UPEC strain 536. In strain JON53 the clyA locus was restored in UPEC isolate 536 as described in Materials and Methods and a kanamycin resistance gene was inserted downstream of clyA. The strain COE2 is a derivative of JON53 with a chimeric clyA::luxAB operon included adjacent to the restored clyA + locus. (B) Hemolysis activity tests with E. coli K-12 and UPEC derivatives on blood plates under Ca2+ depleted conditions due to addition of Na-oxalate (final concentration 2mM). Strains: 536 (UPEC, ΔclyA), JON53 (UPEC, clyA +), J96 (UPEC, ΔclyA), JON47 (UPEC, clyA + ) MC1061 (K-12; clyA +), MG1655 ( K-12; clyA + ), MWK7 (K-12; ΔclyA). Tests were performed in absence (i) and in presence (ii) of Mitomycin C applied onto the center of horizontally streaked rows of the E. coli strains. The images show the center part of the blood agar plates. (C) Detection of ClyA proteins by Western immunoblotting using a polyclonal ClyA antiserum. The immunoreactive bands corresponding to ClyA are indicated with an arrow. Whole cell lysates (lanes 15) and periplasmic fractions (lanes 610; prepared using osmolysis as described in Materials and Methods) were obtained from samples collected at OD600=2.0. Lanes 1 & 6: UPEC strain 536. Lanes 2 & 7: strain JON53. Lanes 3 & 8: strain COE2. Lanes 4 & 9: strain MG1655. Lanes 5 & 10: strain MG1655 hns. To study whether or not the absence of the clyA gene in extra-intestinal E. coli isolates reflects that this gene may be disadvantageous for the bacterial cells, clyA + derivatives of the UPEC strains 536 and J96 were constructed. We used a suicide plasmid derivative (pJON176) and allelic exchange to introduce the clyA wild type allele, together with a kanamycin resistance cassette as a selectable marker at 350bp downstream of the clyA stop codon, resulting in the strains JON47 (J96 clyA + ) and JON53 (536 clyA + ), respectively. A schematic illustration of the construct JON53 with restored clyA + locus is shown in Figure2A. The strains harboring the clyA + allele at the correct position on the chromosome was confirmed by PCR analysis and DNA sequencing (data not shown). The restored clyA wild type allele in the UPEC strains was constructed with DNA sequences from E. coli K-12 and it was evident that these sequences were highly conserved among different E. coli. We performed a multiple sequence alignment of the clyA promoter region and coding sequences using a large set of publicly available E. coli genome sequences (NCBI Reference Sequence: NC_000913.3). It included sequences from different E. coli pathotypes and from commensally occurring isolates (see Additional file 1). Inspection of the upstream region revealed that sequences corresponding to the transcriptional and translational start sequences with the regulatory sequence elements (-35, -10, and Shine-Dalgarno sequences) and binding sites for regulatory proteins (CRP/FNR, SlyA), as defined from studies of E. coli K-12 derivatives, are conserved among the many different ExPEC and non-ExPEC E. coli isolates with intact clyA loci. To assess the level of expression and activity of ClyA in JON47 and JON53, the hemolytic activity of the strains was scored on the blood agar plates. We observed a calcium-dependent hemolytic phenotype in strains JON47 and JON53 when they were grown on blood agar plates. When the Ca2+ chelator Na-oxalate was added (final concentration 2mM), all strains showed a non-hemolytic phenotype (Figure2B, panel i). In our earlier experiments, we showed that lysis of the host bacterial strains promote the release of ClyA using lytic bacteriophages or mitomycin C . To deliberately provoke lysis of the bacterial cells, we placed 2μl of mitomycin C (from a 1mgml-1 stock solution) onto horizontally streaked rows of the strains 536 and J96, and the clyA + derivatives JON47 and JON53 on the blood agar plates (see Methods). Zones of hemolysis appeared for both JON53 (536 clyA +) and JON47 (J96 clyA +), but not for the parental strains 536 and J96 (Figure2B, panel ii). The results clearly indicated that the restored clyA locus in these derivatives (JON53 and JON47) of strains 536 and J96 was expressed and our further tests verified that they could produce the ClyA protein at a detectable level (Figure2C, lane 2 for strain JON53 and data not shown for strain JON47). 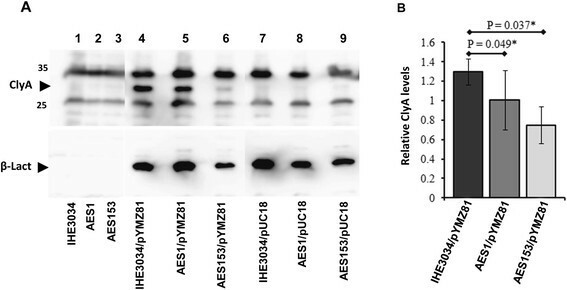 The presence of ClyA protein in the clyA + derivatives was confirmed by Western immunoblotting analysis using polyclonal anti-ClyA antiserum (Figure2C). Subcellular localization experiments showed that ClyA protein was present in the periplasmic fraction of UPEC derivatives to the same extent as has been found in the case of E. coli K-12 (Figure2C, lane 7 for strain JON53 and data not shown for strain JON47). We showed in earlier studies that in clyA + E. coli K-12 derivatives, a small subpopulation of bacterial cells (ca 1-2%) apparently expressed a high enough level of surface-exposed ClyA to be visible by immunofluorescence microscopy . In order to compare the surface expression and export of ClyA protein in individual bacterial cells of the clyA + UPEC derivative JON53 with the standard E. coli K-12 strain MG1655, we performed immunofluorescence microscopy with anti-ClyA antibodies and with the UPEC strain 536 used as negative control. 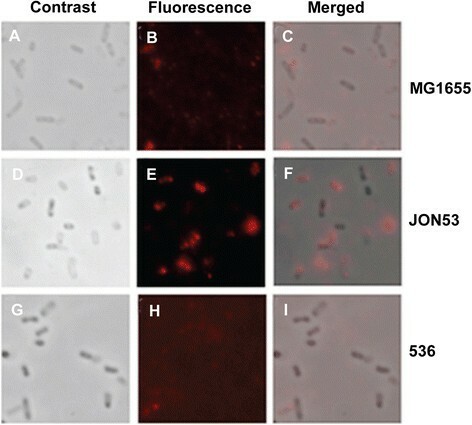 As shown in Figure3, ClyA was detected on the surface of several JON53 cells whereas there was very little immunofluorescence detected in case of the E. coli K-12 strain MG1655. Taken together, the studies of ClyA expression indicated that protein might be present at a somewhat higher level and/or exposed more abundantly on the surface of the JON53 bacterial cells in comparison with that of the E coli K-12 cells. Immunofluorescence microscopy detection of ClyA on bacterial cells. Analyses were done with the E. coli K-12 strain MG1655 (A, B C), the clyA + UPEC derivative JON53 (D, E, F) and the parental UPEC strain 536 (G, H, I). Panels A, D, G show images obtained by by phase contrast microscopy. Panels B, E, H show images obtained from immunofluorescence analysis using polyclonal ClyA antiserum and AlexaFluor 555 conjugated secondary antibody to enable visualization of ClyA as a red fluorescence signal. Panels C, F, I show the merged images. In order to quantitatively monitor the transcriptional expression level of clyA, a clyA::luxAB operon construct was integrated in tandem to the clyA + locus in the chromosome of JON53 as described in the Methods and schematically depicted in Figure2A. The resulting strain was designated COE2 (JON53 clyA::luxAB). In our earlier studies, we observed the growth phase dependent expression of the clyA gene in the E. coli K-12 derivative carrying the clyA::luxAB construct (strain JON33) . 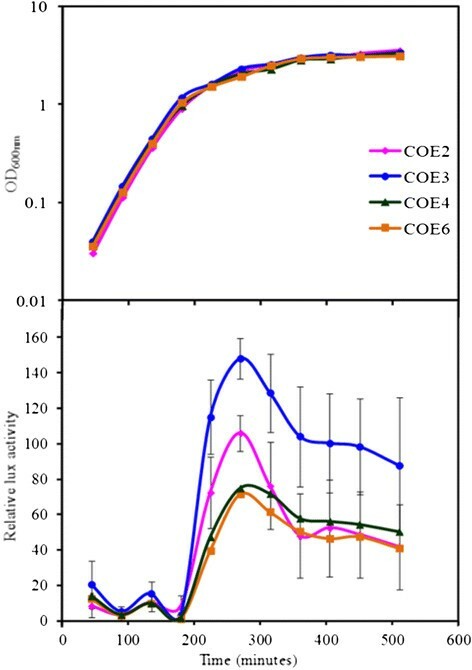 The transcription level of the clyA::luxAB operon in strain COE2 was therefore compared to the level in strain JON33 throughout the growth cycle. 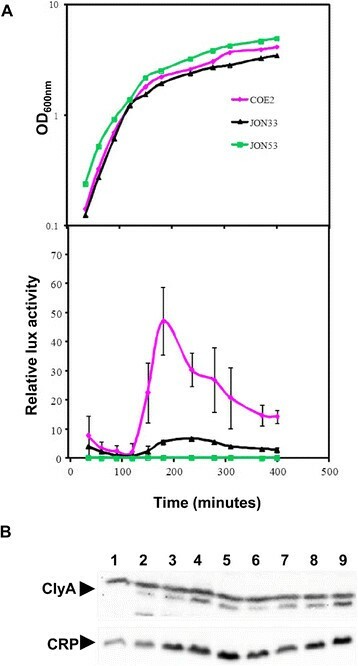 As shown in Figure4A, the luciferase activity of the UPEC derivative COE2 increased continuously during the exponential growth phase and peaked at the late logarithmic phase of growth where it showed a more than five-fold increase compared to the E. coli K-12 clyA::luxAB operon derivative JON33. Growth phase dependent clyA transcription. Bacteria were grown in LB medium (A) at 37C and samples were assayed for luciferase activity as described in Materials and Methods. The strains tested were: the UPEC derivative COE2 (clyA::luxAB), the E. coli K-12 strain BSN26 (clyA::luxAB) and the UPEC strain 536 clyA + (JON53) which was serving as a luciferase negative control. The growth curves (upper panel) are presented from a representative experiment. The data curves for luciferase activity (lower panel) represent the average value of three independent experiments and vertical bars indicate the standard deviations. (B) Immunoblot detection of ClyA and CRP proteins. The immunoreactive bands corresponding to ClyA and CRP are indicated with arrows. Bacteria were grown in LB medium at 37C. Whole cell lysates were prepared from samples collected during different growth phases from the logarithmic phase of growth until the stationary phase. Lane 1: UPEC strain 536. Lanes 25: strain JON53, OD600=1.6 (lane2), OD600=1.74 (lane 3), OD600=2.24 (lane 4) and OD600=2.7 (lane 5). Lanes 69: COE2, OD600=1.5 (lane 6), OD600=1.8 (lane 7), OD600=2.04 (lane 8) and OD600=2.5 (lane 9). In E. coli K-12 the transcriptional regulator SlyA is known to activate clyA + transcription by counteracting the silencing the H-NS nucleoid protein is causing [2,4,5,8]. However, the slyA gene seems to be present in most, if not all, E. coli and the same is true for the hns gene, suggesting that their role in clyA transcriptional regulation (anti-silencing vs. silencing) would be conserved among different non-pathogenic and pathogenic E. coli. Nevertheless, we performed a multiple sequence alignment of the slyA promoter region and coding sequences using a large set of publicly available E. coli genome sequences (NCBI Reference Sequence: NC_000913.3) to see if there would be any differences hinting to altered regulation of slyA expression among different E. coli. It included sequences from different E. coli pathotypes (ExPEC and non-ExPEC) and from commensally occurring isolates. Inspection of the upstream region revealed that sequences corresponding to the transcriptional and translational start sequences with the regulatory sequence elements (-35, -10, and Shine-Dalgarno sequences), as defined from studies of E. coli K-12 derivatives, are completely conserved among the many different E. coli isolates indicating that there would be no obvious difference in slyA expression and regulation (data not shown). Recent studies have shown that there are regulatory proteins (the SfaX/PapX protein family) that show resemblance to the SlyA protein and are encoded by genes in fimbrial gene clusters typically occurring in UPEC isolates but which are absent in E. coli K-12 -. We therefore decided to investigate if the SlyA-like regulator SfaX might influence the expression of the clyA locus. In UPEC strain 536 there are two fimbrial gene clusters, sfa and prs that include genes for such regulatory proteins, SfaX and PrsX, respectively. In order to specifically test if the SfaX protein can influence expression of clyA we performed tests with the sfaX + wildtype and a mutant derivative of the ExPEC strain IHE3034 which is known to have only one copy of the sfaX gene family . A plasmid construct with the clyA + gene under control of its natural promoter region was introduced into strain IHE3034 and the sfaX::kan derivative AES1. A mutant derivative (AES153) defective in the sfaY gene located immediately upstream of sfaX in the same operon was also included. The SfaY protein is predicted to function as a c-di-GMP phosphodiesterase and thereby indirectly involved also in the activity of the transcriptional regulator SfaX . It is also postulated that the sfaY mutation is causing a polar effect that may reduce sfaX expression. The phenotypic test of ClyA-mediated hemolytic activity showed that colonies of the wildtype strain IHE3034 caused stronger hemolysis than the mutant derivatives indicating that its expression and/or release of ClyA was higher than that of AES1 and AES153 (Table3). Western immunoblot analysis of ClyA protein levels, using the plasmid encoded enzyme β-lactamase as reference, indicated that the sfaX + sfaY + wild type bacteria produced a somewhat higher level of ClyA than the mutant derivatives (Figure5). 1)The strains were grown on double blood agar plate and incubated overnight at 37C prior to analysis of the phenotypes. (+++=Strong hemolysis, ++=Weak hemolysis, +=very weak hemolysis and -=No hemolysis). ClyA protein levels in derivatives of ExPEC strain IHE3034. (A) Effect of the sfaX-Y genes on the relative levels of ClyA protein. Samples were taken from cultures grown in LB medium at 37C of the following strains: lane 1, IHE3034 (sfaX + ); lane 2, AES1 (sfaX::kan); lane 3, AES153 (Δ sfaY); lane 4, IHE3034/pYMZ81; lane 5, AES1/pYMZ81; lane 6, AES153/pYMZ81; lane 7, IHE3034/pUC18; lane 8, AES1/pUC18; lane 9, AES153/pUC18. The immunoreactive bands corresponding to ClyA and the plasmid encoded β - Lactamase (used as the control in this experiment) are indicated with arrowheads. (B) Quantification of relative ClyA levels in the strains IHE3034/pYMZ81 and AES1/pYMZ81 calculated from the ratios of ClyA and β Lactamase levels as monitored in the image analyzer (see Methods). The data represent the average value of three independent experiments and vertical bars indicate the standard deviations. An asterik indicates significance in difference according to Student'st-test. As a more direct assessment of the potential influence of the sfaX/papX regulatory gene products on clyA gene transcription in a UPEC strain we tested what effect overproduction of SfaX protein might have. A plasmid with the cloned sfaX + gene was introduced into the UPEC derivative COE2 carrying the clyA::luxAB operons construct in the chromosome. For comparison we included a test with another regulator, the PapI protein known to be part of a regulatory protein complex at the major promoter region of the pap and sfa fimbrial gene clusters in UPEC isolates . The strain carrying the plasmid with the sfaX + gene (pAES1) was named COE3, a vector plasmid control strain was named COE4, and the strain carrying the plasmid with the papI + gene (pHMG95) was named COE6. Samples for Luciferase activity measurements were taken during the growth of these strains in LB medium (Figure6A). The results demonstrated that the UPEC strain carrying the sfaX + plasmid (strain COE3) had a greatly enhanced level of clyA transcription. No such effect was seen with the papI + clone (strain COE6). These results strongly support the suggestion that the presence of SfaX protein in UPEC isolates can cause up-regulation of clyA gene expression and that the effect could be stronger with higher levels of SfaX/PapX proteins in such E. coli strains. Effect of SfaX protein overproduction on expression of clyA. Transcription of clyA was monitored by luciferase measurements with the clyA::luxAB UPEC restored construct COE2 carrying different plasmids as follows: COE2 carrying the sfaX + plasmid clone pAES1 (COE3), COE2 carrying the vector pBR322 (COE4) and COE2 carrying the papI + plasmid clone pHMG95 (COE6). The bacteria were grown in LB medium (Figure6) and the growth curve data are from representative experiments. The data showing relative Lux activities represent the average values of three independent experiments and vertical bars indicate the standard deviations. Considering the relatively high expression levels of the pore-forming protein in the UPEC derivatives, we decided to test the possibility that restoration of the clyA locus in strain 536 might influence its cell wall or membrane properties and perhaps change its susceptibility to antimicrobial compounds directed towards membranes. The strain JON53 was therefore cultured in medium supplemented with serially diluted concentrations of different antimicrobial peptides (Polymyxin B, β-defensin and LL-37), and with different concentrations of urea or creatinine. We compared the MIC values for each antimicrobial compound with the parental strain 536 and the clyA + derivative JON53. Our preliminary studies indicated that there was no difference in MIC values between the two strains for either of the tested compounds (Polymyxin B,β-defensin or LL-37; data not shown). Likewise, there were no differences detected when different concentrations of creatinine in the medium were tested. However, when a sub-inhibitory concentration (0,39 μg/ml, i.e. half the concentration of the observed MIC value 0,78 μg/ml) was present in the medium the clyA + derivative JON53 displayed a somewhat slower growth in presence of Polymyxin B, manifested as a more prolonged lag, than the parental UPEC strain 536 (Figure7A). The normal AUM medium contained 170mM urea. At a two-fold higher concentration (340mM) of urea also the parental UPEC strain 536 seemed more susceptible to the effect of the sub-inhibitory concentration of Polymyxin B (Figure7B). At even higher concentrations of urea (510mM or 680mM) the presence of Polymyxin B per se did not seem to alter the growth much but both strains showed reduced growth. Notably, it was evident that the higher concentrations of urea affected growth of the clyA + derivative JON53 more than that of the parental ΔclyA UPEC isolate (Figure7C & D). Effect of Polymyxin B at a sub-inhibitory concentration on the growth of UPEC strain 536 and the clyA + derivative JON53. Note that the color codes for the strain JON53 and the blank are changed between panels A-B to C-D. The growth was monitored as optical density at OD600nm and the plots show growth in presence of 0.39 μg/ml of Polymyxin B which is a concentration at half the observed MIC value (0.78 μg/ml) in AUM medium with the following concentrations of urea: A) 170mM; B) 340mM; D) 510mM; D) 680mM. The effect of Polymyxin B on growth was also monitored with the E. coli K-12 strains MC4100 and MWK11, the latter being a derivative of MC4100 with a constitutive expression of ClyA protein due to an improved binding site near the promoter for the cAMP-CRP activating complex . These strains showed a similar MIC value (0,78 μg/ml) for Polymyxin B as the UPEC strains. In the growth test with Polymyxin B at half the MIC value (0,39 μg/ml) the higher ClyA expression did not cause any apparent disadvantage but when Polymyxin B was added at a somewhat higher concentration (0,48 μg/ml) the ClyA+ phenotype was correlated to reduced growth also in the case of the E. coli K-12 derivatives (see Additional file 2). In Escherichia coli several different pore-forming cytolysins have been identified. The one most extensively studied is α-hemolysin (HlyA), which is produced by many uropathogenic E. coli (UPEC) strains and contributes to virulence as shown in several animal models . The biological role of the ClyA protein, representing a novel family of non-RTX toxins in Enterobacteriaceae, remains to be discovered, although the distribution of the clyA locus in a wide array of isolates would indicate that it has an evolutionarily conserved function. The clyA gene is clearly conserved in Enterobacteria, i. e., in many E. coli isolates and in typhoid serovars of Salmonella enterica[2,6,9,10]. A functional clyA gene was evidently lost through deletion(s) in several E. coli strains, e. g., in 19 of the 72 ECOR strains, and the ΔclyA alleles were present in a number of different variants. Some strains carried various deletions in the clyA coding sequence and in the upstream region, resulting in truncated clyA loci. In the majority of cases (ΔclyA versions I, II and III), the function of the clyA locus may be effectively abolished by two deletions, removing the promoter region and portions of the N-terminal and central regions of the coding sequence. In ECOR43 and ECOR44, a 12-bp in-frame deletion (corresponding to amino acids 183186 in ClyA) results in the expression, at a level similar to that of the clyA + derivative JON53, of a ClyA polypeptide that was found to have no or very low hemolytic activity (our unpublished data). The presence of short repetitive DNA sequences at the junctions of the major 493-bp deletion in ΔclyA variants I-III (Figure1A) and the 12-bp deletion of ΔclyA variant IV (Figure1B) suggests that these deletions may have been formed as a result of slippage mispairing. The role of direct repeats in deletion formation has been demonstrated by sequence analysis of several deletion mutants in E. coli-. Since no such repeats were identified at the junctions of the other deletions, i. e. the 203- or 217-bp deletions in ΔclyA variants I-III (Figure1B), these deletions appear to have arisen by some other mechanism(s). They could be the result of subunit exchange between DNA gyrase molecules, since this model has been suggested for deletions terminating in sequences that are neither directly nor inversely repeated [47,48]. It also appears that after the functionality of a clyA locus was lost, further alterations occurred, e.g., insertion of an IS-2 element (strains ECOR61 and ECOR62), and non-conservative point mutations in the clyA coding sequence. Considering the possibility that there might be some patho-adaptive selection for mutations in clyA of some E. coli we restored, and studied the expression of, a functional gene locus in the chromosome of the UPEC isolate 536. In order to determine if regulatory genes of fimbrial gene clusters typically present in the chromosome of UPEC can upregulate the expression of clyA, a plasmid carrying the sfaX gene was introduced into the restored UPEC derivative and we observed that the level of ClyA was upregulated at the early stationary phase of growth. Therefore, the sfaX gene does upregulate clyA expression. Although the prevalence of E. coli strains with an intact clyA gene in the ECOR A and B1 groups would support the argument that ClyA has no direct role in virulence, it cannot be ruled out that pathogenic rather than non-pathogenic isolates under certain conditions may express higher levels of ClyA and/or more efficiently translocate the protein. In contrast to the commensal strains, extraintestinal pathogenic E. coli are mostly derived from group B2 and, to a lesser extent, from group D -. There is a phylogenetically clustered distribution of the virulence-associated determinants alpha-hemolysin (hly), type-II capsule (kps), and P (pap) and S (sfa) fimbriae in the E. coli B2 and D groups , and it has been suggested that the B2 strains should be considered highly virulent as evidenced by a mouse model of extra-intestinal virulence . Hence, the fact that every one of the 15 strains in the B2 group of the ECOR collection contained a ΔclyA allele  strongly suggests that E. coli strains adapted for an extraintestinal lifestyle have the clyA gene deleted. On the other hand, it does not necessarily imply that some selective condition(s) or mechanism(s) must be found in the extraintestinal locations where E. coli may reside. In a study using multilocus enzyme electrophoresis and sequencing of the mdh housekeeping gene, it was concluded that pathogenic strains of E. coli do not have a single evolutionary origin but have arisen on several occasions . Similarly, it appears unlikely that there is a common ancestor for all ΔclyA strains, e. g. two ECOR strains in the A group and one in the E group were ΔclyA. The presence of different variants of the truncated clyA locus suggests that clyA is a preferred target for deletion mutations, and that such deletions have arisen on several independent occasions. The adaptation to a particular host may involve loss of virulence traits that are important for infection of a wider spectrum of animals . Similarly, it is possible that the clyA locus could be inactivated in the process of acquisition of new genes (e. g., genes in PAIs) that would promote transition to an extra-intestinal lifestyle. One hypothesis consistent with our present findings would be that the strict regulation of clyA could be lost during this transition. In E. coli K-12 the clyA locus is strictly regulated and its expression is silenced by the H-NS protein . One plausible explanation for the strict regulation in case of such genes appearing as cryptic/silenced would be that less strictly controlled alleles of such genes are disadvantageous to the bacteria under certain environmental conditions . In this context it may be interesting to carry out further studies with strains from ECOR group D that seem to have an intact clyA + locus whereas it remains to be established if they produce ClyA protein and how expression is controlled. In previous studies, it was demonstrated that epithelial cells of the urinary tract in humans and mice secrete an antimicrobial peptide, cathelicidin, upon contact with UPEC and that the severity of the bacterial invasion is linked to bacterial resistance to cathelicidin . While we did not detect any effect of the tested cathelicidin (LL-37) on the growth of the bacteria, it remains to be determined if the clyA + UPEC derivative is more susceptible to such peptides under in vivo conditions. We may hypothesize that the mutations in the clyA gene were selected for either under growth-limiting antimicrobial peptide stress conditions in the urinary tract to which bacterial cells are maladapted or under some other condition of stress for example in the intestine where likewise the combination of a clyA + allele and some other trait(s) might be unfavourable. The mutations in the clyA gene may adapt the bacteria to this stress condition and thereby contribute to the bacterial survival as pathoadaptive events. The constructs described in this work should allow us to test such hypotheses in suitable model infection systems. In order to test the potential impairment of membrane integrity in the restored strain, the JON53 strain was cultured in presence of the antimicrobial peptide Polymyxin B which can disrupt the integrity of the bacterial cell membrane by interacting with its phospholipids. The MIC value for Polymyxin B of JON53 was not altered in comparison with the wild type UPEC strain 536 although there was a clearly detectable negative effect on the growth of the clyA + derivative JON53 when Polymyxin B was added at a sub-inhibitory concentration. Also higher concentrations of urea in the medium caused this differential effect on the growth of the two strains. Although a rather preliminary finding that will need to be studied further, the observed higher susceptibility to the antimicrobial peptide Polymyxin B that was seen in the case of the UPEC with a restored clyA + locus would suggest that such a phenotype is more of a disadvantage in the intestinal locations where other bacteria, e.g. Bacillus, are producing antimicrobial peptides. Sources and relevant characteristics of the bacterial strains and plasmids used in this study are listed in Table1 and Table4, respectively. Bacterial strains were grown aerobically at 37C on LB broth solidified with 1.5% (w/v) agar, or in Luria-Bertani (LB) broth, Poor Broth (PB) , or artificial urine medium (AUM) . Blood agar plates consisted of 5% horse erythrocytes solidified with 1% (w/v) Columbia-Agar (base) (Merck), which according to the manufacturer contains 2.3% (w/v) special nutrient substrate. Ca2+ depleted conditions were obtained by supplementing the blood agar plates with Na-oxalate (final concentration 2mM). Antibiotic selection was performed using 30 μg/ml kanamycin, 12.5 μg/ml chloramphenicol, 50 μg/ml carbenicillin or 15 μg/ml tetracycline. Oligonucleotides were obtained from DNA Technology, Aarhus, Denmark or from TAG Copenhagen, Copenhagen, Denmark. DNA sequencing was performed using the ABI PRISM Dye Terminator Cycle Sequencing Ready Reaction Kit with AmpliTaq DNA Polymerase, and an ABI PRISM 377 DNA Sequencer. For PCR-screening, cloning and sequencing of clyA-like genes we used the oligonucleotide primers umu1 (5′-AATATTTGTCGCTGC-3′) and p79 (5′-TGTCAACAGGTAACTCTC-3′). The primers umu1 and p79 amplify a 1292-bp fragment starting 293bp upstream of the clyA start codon and ending 87bp downstream of the stop codon, based on the sequence of the E. coli K-12 clyA locus [2,61] and our data. Cloning of PCR-amplified clyA-like sequences was performed using the pGEM-T Easy Vector System of Promega, as specified by the manufacturer, and DH5α as a host strain. To construct clyA + derivatives of E. coli 536 and J96, we used the suicide plasmid pJON176 containing the clyA wild type allele and a kanamycin resistance cassette located 350bp downstream of the clyA stop codon. The construction of pJON176 was done as follows: A 3.5-kb Pvu II restriction fragment from plasmid pYMZ62 containing the clyA locus region (between nucleotide positions 1,227,641 and 1,231,223 in the E. coli K-12 genome) was inserted into Eco RV-digested pSL1180 which resulted in the construction of pJON77. 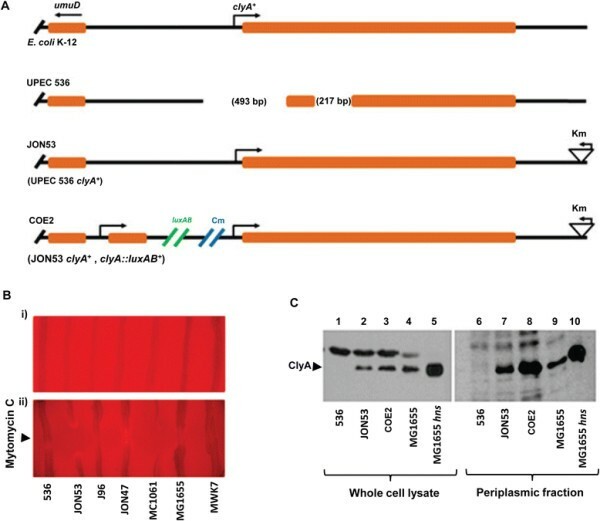 The plasmid pJON77 was digested to yield a 3.2-kb Pvu II-Bam HI fragment that was subsequently ligated into the Bam HI-Sma I-digested pKO3 suicide donor plasmid thus resulting to the construct pJON78. A 1.3-kb Pst I restriction fragment which contains the kanamycin resistance gene from the plasmid pUC4K was then ligated into the Nsi I restriction site of pJON78, i. e. 350bp downstream of the clyA stop codon, to generate the construct pJON176. The clone included the entire 0,4kb intercistronic region and sequences into the umuD gene upstream of clyA such that the otherwise deleted promoter region in the UPEC strains could be restored. Using pJON176 the clyA locus and kanamycin resistance gene was introduced into the chromosome of the E. coli strains 536 and J96, as previously described , to generate the strains JON53 and JON47, respectively. For the purpose of quantitatively determining the level of clyA gene transcription, we introduced a clyA-luxAB operon construct using the suicide plasmid pMWK4 . The pMWK4 plasmid contains DNA corresponding to the sequence 290bp upstream of clyA and 76bp into the clyA coding sequence. The pMWK4 plasmid was integrated in tandem to clyA in the chromosome of JON53 by a single recombination event. The resulting strain was designated COE2 (JON53 - clyA::luxAB). The plasmids pAES1 and pHMG95 were introduced into the strain COE2 by electroporation and the transformants were selected on LB agar plates containing 12.5 μg/ml chloramphenicol, 30 μg/ml kanamycin and 50 μg/ml carbenicillin as appropriate. The resulting strains were designated COE3 (COE2/pAES1), COE4 (COE2/pBR322) and COE6 (COE2/pHMG95). Lytic activity of the UPEC and K-12 strains were analysed using a double horse blood agar plate. The blood agar plate was supplemented with 2mM of Sodiumoxalate ( Ca2+ chelator ). Bacteria were streaked into vertical lines across the plate and 1.5 μl of 0.5mg/ml of Mitomycin C was dripped onto the horizontally streaked rows of strains prior to incubation at 37C for maximum 16hours. Mitomycin C triggers the bacterial SOS response and hence induces the proliferation of lysogenic phages (Walker, 1996) and thus may cause release of cytolysin A that lyses the blood . Approximately five bacterial colonies grown on an LB plate overnight were suspended in 100 μl water or PBS, and 10 to 20 μl of the suspension was placed on a glass slide and air-dried. The cells were fixed with 4% paraformaldehyde (PFA) in PBS for 10minutes and wash with PBS. The slides were covered for 20min with 0.1M glycine diluted in PBS, followed by washes in PBS then blocked with 1% BSA in PBS for 30min. Polyclonal ClyA antiserum was diluted in a blocking solution and then added to the bacteria on the slide at a final dilution of 1:3,000 and incubated for 2hours at room temperature or overnight in 4C. Alexa Fluor 555 anti-rabbit IgG (Invitrogen) diluted 1:500 in blocking solution was applied to the bacterial cells for 1hour at room temperature. Washes in 1 PBS for 15min were repeated five times and the bacteria were then mounted in a fluorescence mounting medium (Dako). The slides were examined at 1000 magnification with a Nikon Intensilight C-HGFI system microscope equipped for fluorescence; the images were obtained with a Hamamatsu DRCA-ER camera. Colonies of the bacterial strains MG1655 (K-12), JON53-clyA + ::luxAB (COE2), COE3, COE4 and COE6, from plates incubated overnight were inoculated into LB broth medium. The bacteria were cultured aerobically at 37C. The optical density (OD600nm) was measured during growth at different time points. In parallel, the transcriptional activity was measured in a Sirius luminometer using decanal as a substrate. One hundred μl of a 0.1%v/v suspension of decanal (Sigma) in water was added to 100 μl of bacterial culture as programmed by the Sirius instrument and light emission was measured. Triplicates were measured for each sample and specific activity (lux activity units/OD600nm) was calculated and plotted. Sub-cellular fractionation was performed essentially as explained before . For sub-cellular localization of ClyA, E. coli cells were grown in LB medium at 37C until late logarithmic phase (OD600nm≈2). To prepare whole cell lysate fractions, the bacteria (1ml) were centrifuged at 12,000×g for 5min and the bacterial pellet was resuspended in (80 ul) 20mM TrisHCl pH8.0 buffer. SDS-polyacrylamide gel electrophoresis (SDS-PAGE) analyses of proteins were performed as described previously . Five μl (from 80μl) of the bacterial suspensions were loaded in the well. To prepare periplasmic fractions, bacterial suspensions (1.5ml) with a cell density of approximately 5×109/ml were harvested by centrifugation. The pellet was washed twice with 10mM TrisHCl (pH8.0) three times and resuspended in 20mM TrisHCl (pH8.0), 20% (wt/vol) sucrose, and 0.1mM EDTA at 25C. After 10min the cells were pelleted and resuspended in sterile distilled water. After incubation on ice for 10min, the cells were removed by centrifugation at 12,000×g. The supernatant was used as the periplasmic fraction. Periplasmic proteins were concentrated by precipitation with ice-cold 10% trichloroacetic acid containing 1mg/ml deoxycholate. The precipitated proteins were collected by centrifugation at 12,000×g, washed with acetone, dried under vacuum, and dissolved in sample buffer (50mM TrisHCl (pH6.8), 10% glycerol, 5% β-mercaptoethanol, 2% sodium dodecyl sulfate (SDS), 0.05% bromophenol blue). Samples were neutralized by addition of saturated Tris solution and boiled for 5min at 100C. Western immunoblotting was performed as previously described . The proteins were detected using different primary polyclonal antisera: polyclonal anti-ClyA antiserum , and the anti-CRP polyclonal antiserum  recognizing E. coli cyclic AMP receptor protein (CRP), which was used as an internal control for cytoplasmic protein and antiserum recognizing TEM-β lactamase  which was used as the periplasmic protein loading control for strains carrying carbenicillin resistance plasmids. The immunoreactive bands were visualized by scanning using a luminescent image analyzer LAS 4000 IR multi-color (Fujifilm) and/or by exposure on the Hyper film (Amersham Biosciences). MIC determination: Liquid growth inhibition assays were performed essentially as described earlier . Briefly, ~5 bacterial colonies from an overnight culture plate were suspended in Poor Broth (PB) medium (1% Bactotryptone, pH7.5) or artificial urine media (AUM) and grown aerobically at 37C overnight. Bacterial suspensions were diluted to an OD600nm=0.01 and grown to approximately OD600nm 0.2 - 0.4 to obtain an exponential phase culture. In a flat-bottom 96-well plate (Falcon), 95 μl of the medium was added to all wells, 5 μl of the bacterial culture (OD600nm=0.2) was added to each well at a final OD600nm of 0.001 (1 105 cells/110 μl) and a 10 μl sample of two-fold serially diluted solutions of the peptide (polymyxin B, β-defensin or LL-37) was added to obtain a range from highest (50 μg/ml) to lowest (0.097 μg/ml) concentrations in the series of wells containing bacteria and medium. To determine the effects of some of the components in AUM, media containing higher concentrations of urea (i.e. 340mM 680mM) and twice the concentration of creatinine (i.e. 14mM) were used. The positive control wells contained only bacteria and medium while the negative control well contained medium and water. The plate was incubated for 16hours aerobically at 37C in a TECAN Infinite M200 fluorescence multiplate reader and bacterial growth was monitored by measuring absorbance at OD600nm at 5minute intervals. MIC values are defined as the lowest concentration that causes 100% growth inhibition. The following Polymyxin B susceptible and resistant organisms were used as controls: V. cholerae strain 569B (MIC=1.5 μg/ml), V. cholerae strain A1552 (MIC=50 μg/ml), E. coli strain MC4100 (MIC=7.8 μg/ml), E. coli strain MWK11 (MIC=7.8 μg/ml). COAE carried out molecular genetic studies, performed the statistical analysis and participated in the drafting of the manuscript, JO, NZ, MW and MD carried out molecular genetic studies and participated in the drafting of the manuscript. SNW and BEU conceived of the study and participated in its design and coordination and helped to draft the manuscript. All authors read and approved the final manuscript. The authors wish to thank Katrin Bock and Anders Magnusson for valuable assistance with the initial experiments and Dr. Annika Sjstrm for good advice and sharing of materials. This work was supported by grants from the Swedish Research Council to BEU and SNW. JO was supported by a Research Associate Fellowship and research funds from the Faculty of Medicine, Ume University.